For the follow up examination of patients fill in the form "Telemedical maritime assistance - follow up" and fax these to Medico Cuxhaven as well. For our quality control and improvement of our assistance, we ask you to please give a brief evaluation with our form "Telemedical maritime assistance - post advice questionnaire". 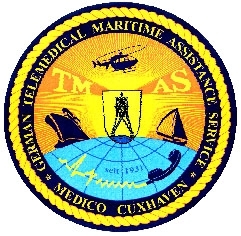 The telemedical maritime assistance service (Medico Cuxhaven) supports and gives advice to seafarers in case of sickness, accidents, maritime emergencies and other incidents on board that require medical advice. The telemedical maritime assistance service (TMAS) is an essential part of the health protection of seafarers. The telemedical maritime assistance service is available 24 hours a day, free of charge and available to all ships around the world. The assistance is carried out by specially trained physicians of the Helios-Klinik Cuxhaven. You find concise information in our flyer.